We are your eco-friendly source for alternative growing solutions. Our products provide nutrients that enable growers of plants, crops, lawns, and gardens to grow healthier plants. The results are higher yields and more lush, beautiful and nutritious vegetation of all varieties. And, our products often reduce the need for traditional fertilizers and chemicals. We are committed to providing economical and effective products combined with honest and attentive customer service. Tara means “Earth” and we exist to do our part to sustain it for generations to come. Summertime is here, along with Florida’s ban against fertilizers with any Nitrogen in the chemical mix. Effective from June 1 through September 30, these bans create a struggle for most residents and lawn care professionals. Floridians worry about the fate of their plants in the summer sun, without fertilizer. 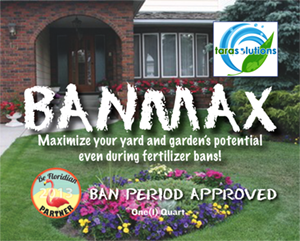 Tara Solutions introduces BanMax for a stress-free, nitrogen-free summer. BanMax is a 0-0-7 product available to use during summer nitrogen bans. BanMax contains the optimum combination of components and trace minerals without nitrogen. BanMax results with healthy root structure, thicker blooms, stress resistance, quick green up; healthier, brighter, and longer lasting plants. BanMax is a liquid product containing 90 trace minerals, carbon with new technology, humic acid, high end sugars, and potassium. It is rain fast ready. Spray it on the plant for absorption within 15 minutes. Calcium, the king of crop nutrients, is known for its essential function in plants. Known benefits include building strong cell walls for sturdier plants, increased vitality, and increased nutrient uptake. Plants take in calcium, along with water, through their roots. Therefore, the calcium has to be in soluble form in order to be useful. The calcium that is added to most soil amendments is insoluble. Tara Solutions’ KING CALCIUM is a liquid solution that is readily available to the plant. KING CALCIUM is 100% available. By using King Calcium you will observe the gains in improved soil structure, improved nutrient uptake, balanced PH, decrease disease, less hardpan, reduced salts, and increased drought tolerance. King Calcium, is specially complexed with other ingredients to stay in suspension in your liquid nitrogen or water. It will stabilize your nitrogen applications, reducing leaching and denitrification. It can be mixed with 28% or 32% liquid nitrogen and applied or it can be broadcast just ahead of all types of nitrogen fertilizer applications. By utilizing King Calcium in your fertilization program you should expect improved plant health and retention of nitrogen. By reducing your nitrogen usage you will save money and improve your bottom line. Skeeter Gone is an eco-friendly mosquito killer that is non-toxic, non-hazardous, and does not leave any chemical residue. It kills mosquitoes and other soft-bodied insects (and larvae) on contact. Click Here to visit the Skeeter Gone Page. Skeeter Gone has been listed by the Organic Material Review Institute. OMRI supports organic integrity by providing an independent review of products intended for use in certified organic processes. Skeeter Gone utilizes natural surfactants and crop oils to eradicate these small, but hungry pests, in a completely safe manner. It can be applied both commercially and residentially. Application by aerial, fogging, and spray methods are all acceptable. Skeeter Gone can be applied safely over or adjacent to ponds and other standing water without harming aquatic life. This unique application capability allows you to get rid of developing larvae for better and longer pest control. Tara brings you only the best fertilizer products.